FILE - Ethiopian soldiers patrol in Baidoa, Somalia, Feb. 29, 2012. Ethiopia has had troops in Somalia for years as part of an African Union mission mandate to fight al-Shabab, but hundreds more have crossed into Somalia recently. Hundreds of heavily-armed Ethiopian troops have crossed into Somalia, reportedly to assist a Somali government offensive against al-Shabab militants. Residents in the border town of Dolow, in Somalia's Gedo region, say they saw at least 30 vehicles carrying Ethiopian troops crossing into Somalia late Tuesday. Witnesses who spoke to VOA Somali on condition of anonymity estimated that 1,000 Ethiopian soldiers entered Somalia. One resident said the troops were riding military vehicles and pickup trucks mounted with machine guns. Ethiopia has thousands of troops in Somalia as a part of AMISOM, the African Union force fighting al-Shabab. Regional authorities contacted by VOA on Wednesday confirmed the new Ethiopian military movements. "The Ethiopian troops as a part of AMISOM have already been in the region, and their current movement is part of the response to the Somali president's call for a massive attack on al-Shabab militants," said Mohamed Husein al-Qadi, the deputy governor of Gedo region. Local residents say they have not seen such heavy Ethiopian troop movements since 2016, when Ethiopian troops, who were not part of AMISOM, vacated a series of military bases, sparking fears of a militant resurgence and a possible setback for African Union efforts to stabilize Somalia. The report of the new Ethiopian troops crossing into Somalia came as Somali government troops and their African Union allies prepare for a large-scale offensive against al-Shabab militants, according to multiple witnesses and government officials. In advance of the offensive, the Somali government's top leaders and the leaders of Somalia's federal member states are meeting in Mogadishu for a second day to resolve political differences over the recent Saudi Arabia-Qatar diplomatic dispute. FILE - A Somali soldier helps a civilian who was wounded in a blast in the capital of Mogadishu, Somalia, Oct. 14, 2017. During the opening of the forum Tuesday, President Mohamed Abdullahi Mohamed threatened to retaliate for the truck bombing of a busy Mogadishu intersection on Oct. 14 that killed more than 300 people. Al-Shabab did not claim responsibility for the blast, but officials blamed the group and few Somalis doubt the accusation. Somali Prime Minister Hassan Ali Khaire vowed Wednesday to defeat al-Shabab as he spoke at a graduation ceremony for more than 300 Somali National Army soldiers. 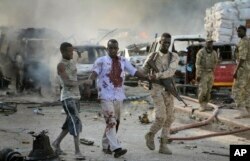 The soldiers were trained at a military base in Mogadishu run by the United Arab Emirates. Khaire said the troops signal the government's commitment to "liberating our country from al-Shabab, the terrorist group. We have a full confidence that these troops will return the image of Somalia by eradicating the terrorists."